Wallet for travel tickets issued by Cook's Wagon-Lits World Travel Service. Blue leather folder embossed in gold, fastened with black tape. Inside paper pocket for tickets (empty). Leather wallet for a 50mm yellow filter cemented gelatine. Wallet containing pocket diary, leather cover with paper insert, Midland Railway, issued by the Company to their Directors and Chief Officers, 1893-94, pre-printed with dates of Directors Committees and days of meetings,red ocver with gilt wyvern on front, issued to W H Hodges, Company Accountant 1866-1897. Wallet, plastic, BR (Manchester Division) card and pass wallet. Wallet issued to employees to hold cards, tickets and passes. Blue plastic cover with Class 87 depicted in gold on front, lettering "Manchester Divison" and BR double arrow logo, 4 clear divisions inside. Black plastic wallet for pair of firefighting gloves. Wallet designed by Mandana Macpherson, made from reclaimed automobile and bicycle inner tube. Brown leather rectangular wallet, inscribed ‘COURSES DE PARIS À ROUEN / DONNÉ PAR LA / COMPAGNIE PARISIENNE DES VÉLOCIPÈDES’, unsigned, French, 1870-1873. Presented to James Moore following a velocipede race, believed originally to have contained a 1,000-franc note, French, 1870-1873. Leather wallet for a 50mm orange filter. Wallet, vinyl, Safety, issued by British Rail Safety. Wallet intended to hold cards summarising safety policy. Black, with double arrow logo and 'Safety' in white on the front. Belonged to Robert Hilton, signalman at Whittlesey signal box, Peterborough. Wallet, For Great Western Railway identity card (2003-8040), Red with gold lettering. Wallet. 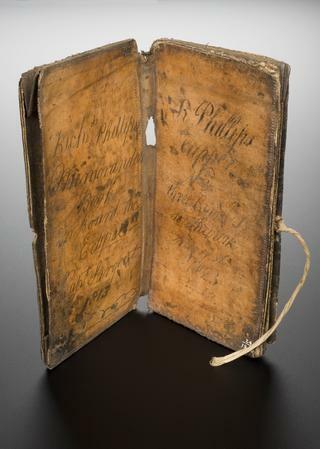 London & North Eastern Railway Gangers Wallet. Leather bound note book with instructions for the laying of permanent way, issued to J Barker, York. London & North Eastern Railway and Great Eastern Railway Provident Savings Bank cover for depositor's statement of accounts. Green canvas printed in black lettering with two metal press stud fastenings. 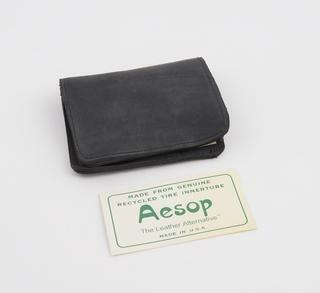 Wallet, London & North Eastern Railway, Save to Travel by L.N.E.R., a wallet for stamps and vouchers, green and black. Save to Travel by L.N.E.R. Wallet, London & North Eastern Railway, "Save to Travel" wallet, for saving for railway tickets, 1930-1940, card wallet containing savings stamp card and 1 shilling stamp.